In a review of Robert E. L. Masters and Jean Houston’s 1968 book Psychedelic Art—the first book devoted to the topic—a critic for Art in America wrote, “To take issue with the authors . . . is much like attacking a couple of recipients of revealed truth for their beliefs.”4 The text was described as long on conviction, but short on evidence to support the claim that such a thing as psychedelic art exists, and that it is interesting. In the case of Rubin’s catalogue, the images are largely left to speak for themselves, and they almost convince us of their psychedelic sensibility: Frank Stella’s Double Scramble (1968), a Day-Glo stripe painting so patently trippy that it inspired Rubin to curate the show, dares us to account for its Technicolor vibrancy solely through the critical language of Minimalism. 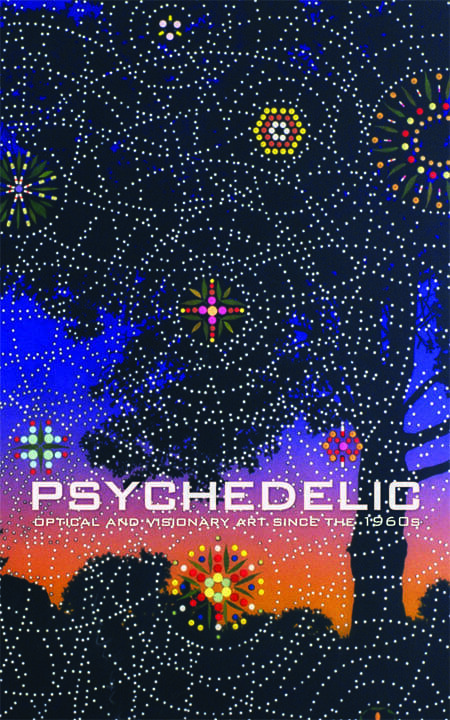 In other words, the book’s presentation of this and other works within the framework of psychedelia relies on their resonance with the clichés of psychedelic visual culture, including “extreme color,” “kaleidoscopic space,” “obsessive mark making,” “immersive environments,” “pictorial fragmentation,” and “invented universes.” These formal comparisons, however, are buttressed only by the flimsiest of historical circumstances (e.g., the fact that Double Scramble was made in 1968, at the height of the psychedelic counterculture) and all-too-rare personal testimonies. The catalogue’s essay by the countercultural guru Daniel Pinchbeck—in which the author at one point entertains fellow guru Terrence McKenna’s theory that psilocybin mushrooms were sent to Earth by alien lifeforms—also labors to embed these works within the discourse of psychedelia. But the more they speak to Pinchbeck and his followers, the less these objects seem to have to say to art history: if they are informed by a psychedelic sensibility, it is not readily apparent how that information might impact our existing narratives of modern and contemporary art. While Rubin aims to expand the canon of works that have a psychedelic (that is, “optical” or “visionary”) sensibility, Johnson more ambitiously aims to expand our sense of what counts as psychedelic in visual art. He provides ample evidence for his conspiracy theory that psychedelia is everywhere, but in doing so, he also comes close to claiming that psychedelic experience includes everything. His close readings in particular can be insightful, as in his parsing of Christopher Williams’s staged photo of an overturned Renault Dauphine-Four as a meditation on the promise—and futility—of the anarchic energies of May 1968 (Johnson, 65). His suggestion, however, that psychedelic experience fosters anti-authoritarianism, and also triggers metacognition, intensifies the experience of embodiment, hastens sexual awakening, develops one’s sense of humor, and so forth, makes his argument that Williams’s work has a psychedelic sensibility almost meaningless: following Leary, one wonders if every work of art—not simply every work of contemporary art—might be psychedelic. Consequently, when he separates a work from its familiar art-historical context in order to review it with his new “heuristic,” Johnson sometimes offers a reading that seems to obscure rather than illuminate its object. Even if a work compels us to reevaluate it through the kaleidoscopic lens of psychedelia (and many here do), what do we ultimately gain by recognizing its true (psychedelic) colors, so to speak? The field of art history would perhaps benefit more from deploying the rhetoric of psychedelia to rub these objects against the grain, allowing that rhetoric to disturb, for example, our received notions of Minimalism. 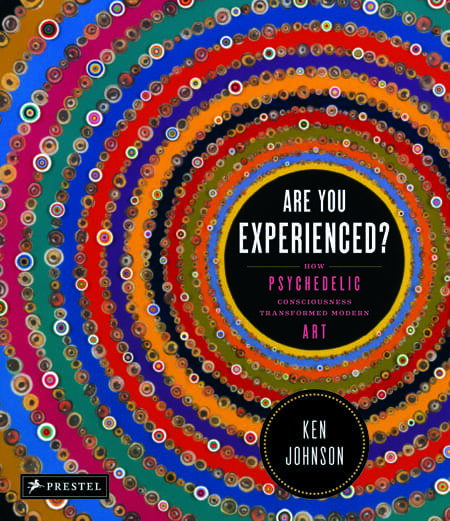 At their cores, both of these books attempt to turn psychedelia into a mainstream art phenomenon: according to these authors, the psychedelic sensibility is pervasive, even if its influence on art often goes undetected. Like the hidden patterns “revealed” by tripping, it is an invisible force that structures the world—including the paintings of Frank Stella, or the steel sculptures of Richard Serra, as Johnson claims. Yet instead of moving psychedelia from margin to center, it might be more valuable to preserve some of psychedelia’s outsider, or more specifically oppositional, status; following Lars Bang Larsen (who follows T. J. Clark), perhaps psychedelia is even a “limit term” of modernism.5 In their anthology West of Center: Art and the Counterculture Experiment in America, 1965–1977, Elissa Auther and Adam Lerner remind us that the term “counterculture” was coined in the 1960s to designate “an oppositional movement with distinct norms and values generated out of its conflictual interaction with the dominant society,” in contradistinction to a subculture, which is “a mere subset of dominant society” that is “neutral with respect to dominant society’s values.”6 Auther and Lerner argue the importance of reevaluating 1960s and 1970s countercultural art (including but not limited to psychedelic art) despite or even because of its oblique relation to the mainstream East Coast art of the period; this approach seems more productive than insisting that the former meaningfully informed the latter. Using more nuance to characterize the relation of technology and psychedelia would not only connect these books to ongoing art-historical debates, but also prompt a new discussion of the politics of psychedelic art. The idea that the historical counterculture was apolitical, and therefore indifferent to the radical activism of the New Left and other movements, has long been dismantled; as Julie Stephens has argued, a major aim of the counterculture was to redefine the notion of politics, and groups like the Diggers and the Yippies are best understood on their own terms.8 Consequently, it is disingenuous to claim that psychedelic art typically responds to “the raging world of globalization, transcultural collisions, economic decline, envi-ronmental disaster, and military confrontations at all levels” with a “desire to go inward,” as claimed by the third contributor to Rubin’s catalogue, Robert C. Morgan (47). The same tired association of psychedelia with self-absorption informs Johnson’s fantasy of simple life on a rural commune (which, to his credit, he freely admits is problematic). The only author in these books to connect psychedelic consciousness to contemporary politics is Pinchbeck, who compares our “current economic and environmental meltdown” to “the dismemberment and detaching that shamans undergo in dreams and visions”: as we painfully become aware of the dangers of debt-based global capitalism, we are analogues of those psychedelic voyagers who seek the true reality behind false illusion (Rubin, 53). On its face, this is not a productive observation, but on further inspection, it echoes Diedrich Diederichsen’s compelling comparison of hallucinogenic drugs, which “alienate” us from our everyday reality, to Marxist strategies of pulling back the veil of reification.9 Diederichsen articulated his politics of hallucination—inspired by the drug-induced ruminations of Walter Benjamin himself—in the catalogues for Ecstasy and Summer of Love, the very exhibitions from which Rubin and Johnson are so eager to distance their own projects. This is unfortunate, as his theorization offers us another avenue to what these two books are missing, from an art-historical perspective: a sense of the larger critical stakes of a psychedelic sensibility in art. Tina Rivers is a PhD candidate in the department of art history and archaeology at Columbia University. Her dissertation is the first major study of the Howard Wise Gallery, examining its role in the rise of media art in the 1960s. Her writings have appeared in publications such as Art in America and Framework: The Journal of Cinema and Media, as well as in several books, and her criticism appears on Artforum.com. The review originally appeared in the Winter 2013 issue of Art Journal.